History: 60 year old female with lower extremity pain, swelling, and redness. 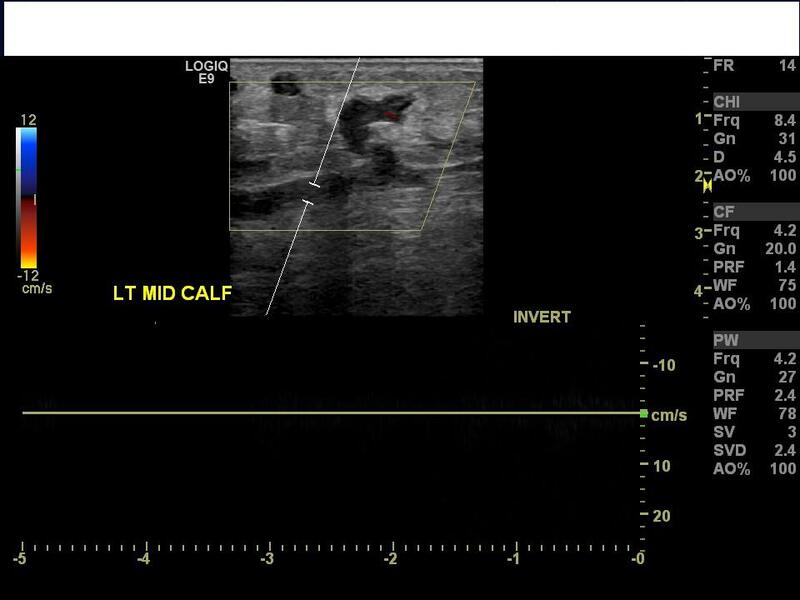 Superficial Thrombophlebitis: Ultrasound image of the left mid calf with color doppler shows multiple dilated veins which fail to compress and contain internal echogenic clot. Additionally, no internal flow is present. This is a case of superficial thrombophlebitis, which is an inflammatory-thrombotic disorder of the superficial venous system. Typically it presents with pain, swelling, and warmth in the lower extemities with a “palpable cord,” which represents a thrombosed vein, as in the image above. When thrombophlebitis occurs in the breast, it is called Mondor Disease. There is a risk of extension of clot into the deep venous system of the legs, and possible pulmonary embolism.